Under his leadership, the FCC has rolled back major rules blocking the expansion of telecom and broadband networks. In this Question and Answer session with the Mackinac Center for Public Policy, Pai will talk about how the agency has changed under his 18 months as chairman, such as rolling back burdensome regulations like the Obama-era Title II “net neutrality regulations,” how the Commission is working with states and private industry to expand connectivity, and what the future holds. Ajit Pai is the Chairman of the Federal Communications Commission. He was designated Chairman by President Donald J. Trump in January 2017. He had previously served as Commissioner at the FCC, appointed by then-President Barack Obama and confirmed unanimously by the United States Senate in May 2012. Chairman Pai graduated with honors from Harvard University in 1994 and from the University of Chicago Law School in 1997, where he was an editor of the University of Chicago Law Review and won the Thomas R. Mulroy Prize. In 2010, Pai was one of 55 individuals nationwide chosen for the 2011 Marshall Memorial Fellowship, a leadership development initiative of the German Marshall Fund of the United States. 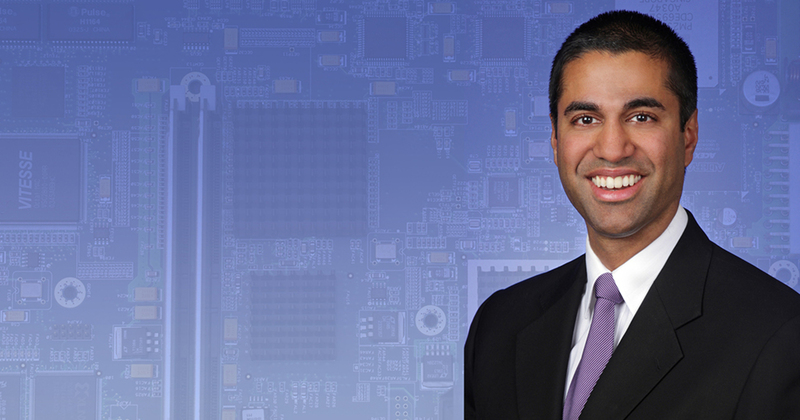 The son of immigrants from India, Chairman Pai grew up in Parsons, Kansas. He now lives in Arlington, Virginia, with his wife, Janine; son, Alexander; and daughter, Annabelle. Breakfast is free and will be provided for attendees who RSVP. Please register online here.